What can be more exciting than vivid lights, excellent graphics, amazing sounds and huge payouts that slot machines constantly offer? Games are developed for entertainment, but very often they become addictive for many players which turns into a serious problem. There is a great number of players that have become obsessed with slots. 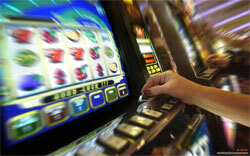 Below we will try to analyze the problem of slots addiction. NB: Slot machines addicts cannot control their gambling impulses. Being slots addictive such people are not able to stop gambling without others` people help. In spite of the fact that they may lose a lot, they try to find all possible ways to get money in order to have some extra spin. The odds may be against such players but they do continue their gambling. The problem of slots addiction does not appear instantly it grows gradually disrupting players life at all levels. The slots addicts must admit that they do have the problem. No kind of treatment might be useful unless player does not understand the kind of problem he suffers. Since the person has realized the problem, he has to reveal it to other family members or friends in order to get some support. The next step will be to ask for help of appropriate specialists that will help you to cope with the problem you are suffering from. If you find yourself slots or just gambling addictive, do not postpone your recovering! Act immediately!